September 10, 2018 — CNC specialist NUM is helping one of the USA’s top fabrication equipment manufacturers to develop an ultra-precise 5-axis bevel head for its market leading waterjet cutting system. This innovative engineering project will enable customers to use extremely fast abrasive cutting speeds to further increase productivity of their precision metal parts fabrication processes. 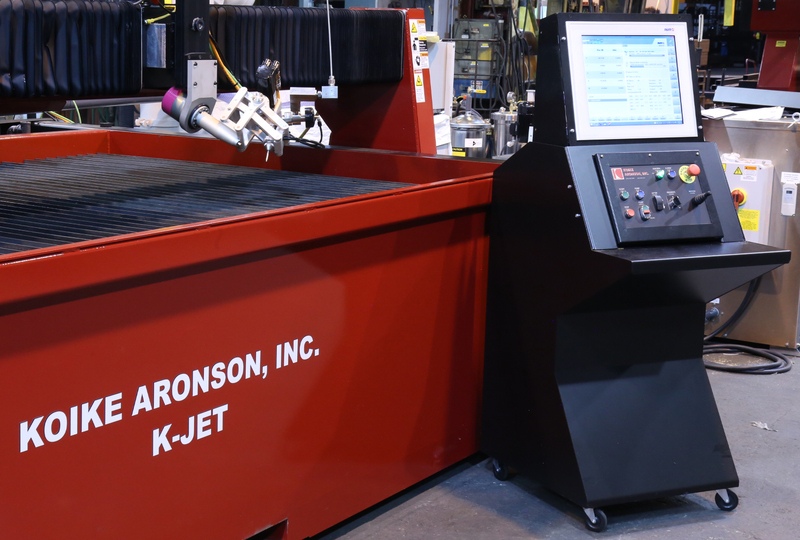 Koike Aronson, Inc. is a leading manufacturer of advanced cutting/welding machines and positioning equipment. Founded in 1918, the company is based in Arcade, NY, USA. Capable of operating three manufacturing shifts per day, with up to 100 employees, Koike is renowned for its expertise in metal fabrication systems; its research and development resources include mechanical, electrical and software engineers with more than 250 combined years of design, process and technical experience. Koike’s latest generation waterjet cutting system, the K-Jet, is designed to cut various types of material – including steel, aluminium, plastic and glass – without creating any heat-affected zones. 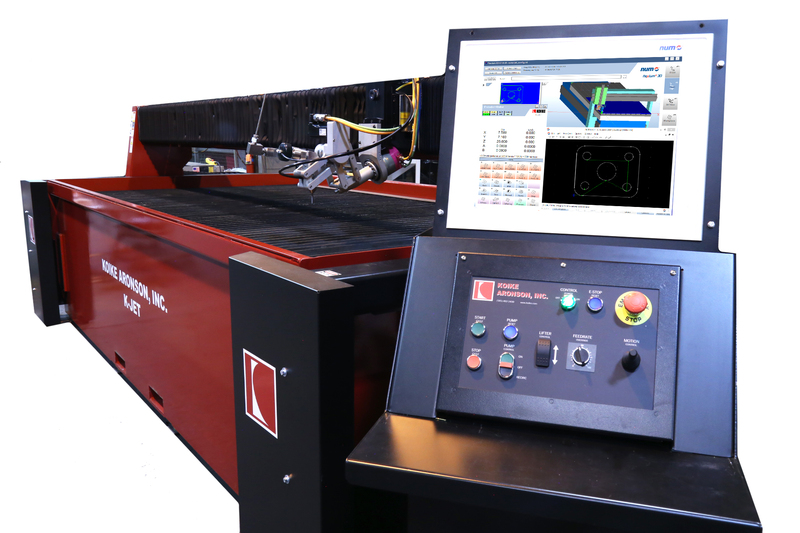 There is a choice of five machine configurations, offering standard cutting areas up to 72 x 144 inches (1,829 x 3,657 mm), and three KMT intensifier pumps with pressure ratings as high as 90,000 psi, making it the world’s fastest waterjet cutting system for straightline cutting. Each K-Jet machine features a robust, floor-mounted cutting table with a load capacity of 125 psf (610 kg/m2), which is equivalent to supporting 6 inch mild steel. The tables employ a heavy duty precision machined main beam and saddles, fully enclosed air pressurised bellows, and hidden linear guide ways. There is a wide choice of optional Ebbco abrasive removal and closed loop filtration systems for efficient water management. Tel: +44 (0)871 750 4020; sales.uk@num.com; www.num.com. 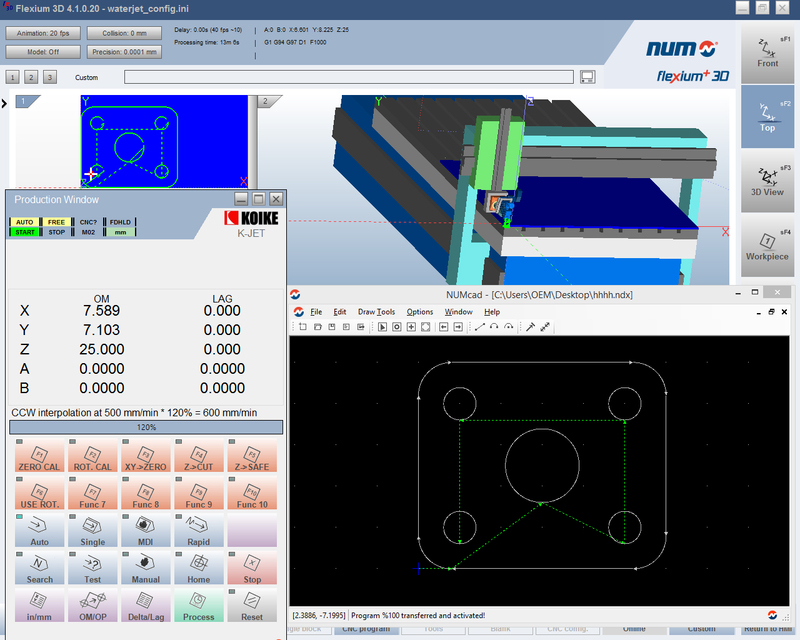 NUM has helped Koike Aronson to develop an ultra-precise 5-axis bevel head for its market leading K-Jet waterjet cutting system. The cutting head’s HMI (human-machine interface) is based on a large 19-inch touch screen from NUM. The Flexium+ screen provides intuitive user guidance.